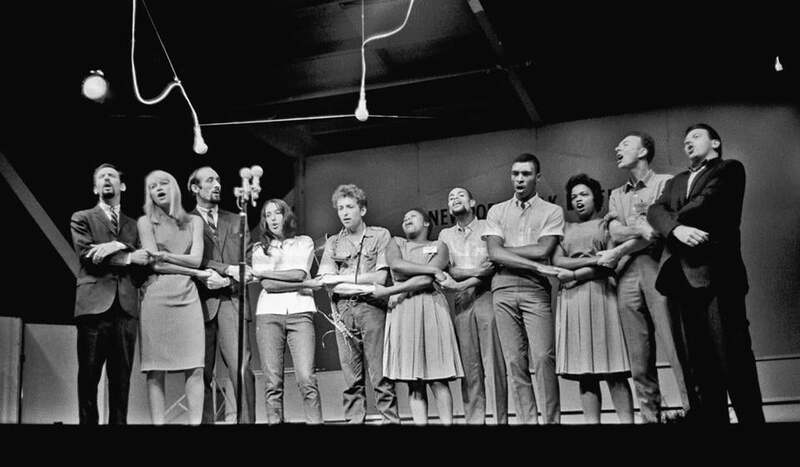 Peter, Paul, and Mary; Joan Baez, Bob Dylan, the Freedom Singers, Pete Seeger, and Theodore Bikel sang “We Shall Overcome” at the Newport Folk Festival in 1963. In his new book, Grammy-winning writer Elijah Wald looks at the folk-revival scene of the 1960s through the careers of Pete Seeger and Bob Dylan, two of its stars, and how all was changed when Dylan “went electric’’ at the 1965 Newport Folk Festival. Wald (inset), who lives in Medford, traces the fallout of that performance, arguing that it helped cement the primacy of rock as the music of the generation and set the stage for 1967’s Summer of Love and 1969’s Woodstock festival. Wald contends that the folk revival worldwide flowed from Seeger and his band The Weavers, calling the first chapter of his history “The House That Pete Built.” But more than half the chapter titles are named for a Dylan song or the lyric of a Dylan song, not that those chapters are exclusively about Dylan. They aren’t. In the first two-thirds of the book, Wald lays out the modern saga of the genre, introducing or reintroducing readers to folklorist Alan Lomax, blues musician Lead Belly, and folk singers Woody Guthrie, Burl Ives, Aunt Molly Jackson, and Bascom Lamar Lunsford. 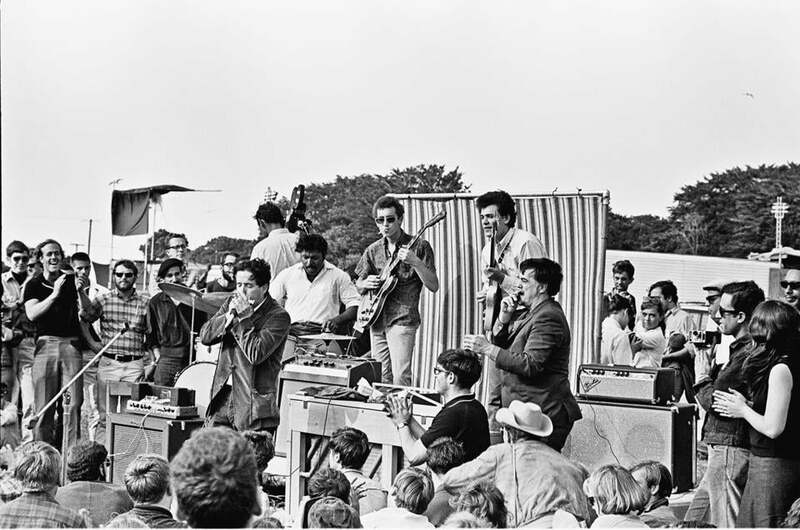 The Butterfield Blues Band, with Alan Lomax on the right, in an undated photo. Lomax was something of a musical go-between for many folk singers. He introduced Seeger to blues musician Lead Belly, who taught Seeger how to play the 12-string guitar. By 1940, Seeger made his first appearance as a folk singer at a “Grapes of Wrath” concert with Lomax, Ives, Jackson, and Guthrie. A prolific songwriter known for “If I Had a Hammer,” “Where Have All the Flowers Gone?,” and “Turn! Turn! Turn!,” Seeger was primarily a live performer who became a central figure behind the Newport Folk Festivals. If Seeger got the people singing, it was George Wein and Theodore Bikel who helped Seeger get the Newport festivals going. The events took place over several days, with a few hundred performers. They included workshops — originally music sprinkled with discussions and demonstrations, but people eventually just considered them mini-concerts. They were profitable, but after 1965, the festival starting losing money, and then came the rift between folk and the tone of the times. The final section of the book recounts the watershed festival and examines its aftermath. Dylan’s performance at Newport is the stuff of musical legend. Over the years, accounts have differed over what actually happened. Wald contends that Dylan was booed and cheered. What you heard and what you saw depended on your place in the crowd. And what you heard was, in part, determined by faith. The “fervent young believers” saw Dylan’s electric music as a taste of things to come, but others, just as young and just as fervent, saw him as a sellout. Then there were those whom Wald calls “uncomprehending old folkies” who thought that electric amplitude interfered with the music, and they might have inspired the legend that Seeger threatened to cut Dylan’s cables with an ax. 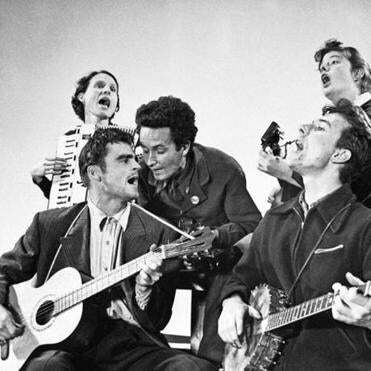 Sis Cunningham, Cisco Houston, Woody Guthrie, Bess Lomax, and Seeger in the 1940s. Besides his love for folk and its musicians, Wald respects Dylan and writes, “He was more than a musician, more than a poet, certainly more than an entertainer: he was the Zeitgeist, the ghost-spirit of the time.” He goes on to assess how Seeger, Dylan, and the folk revival influenced bands such as the Beatles and the Rolling Stones. Wald doesn’t quite revere Dylan, and throughout this thoughtful book he considers the singer-songwriter from Duluth, Minn., less than a holy ghost, but, rightfully, not much less. A lot of books have been written about Dylan and folks have been debating the truth and the myth ever since. To paraphrase Dylan: People disagreeing everywhere you look / makes you wanna stop and read Wald’s book.